Melamine is a durable thermoplastic surface much like formica. For easy clean-up choose 100% Melamine cabinets available in four standard shades. Custom cabinet colors are an upgrade. Hundreds of cabinet colors and patterns are available. Please ask your designer to see for upgrade pricing. Changing the trim color of a cabinet is an upgrade. This includes power coating raw aluminum to the desired color and changing the T-Molding of the cabinet to match. Ask your designer for upgrade pricing. 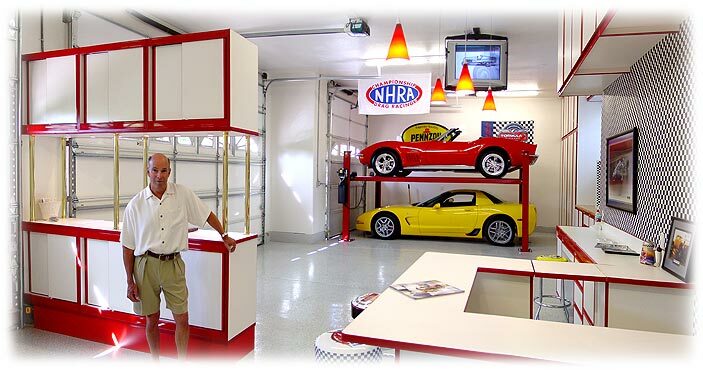 A cabinet island with down lights to display your racing trophies... a bar where you can bend an elbow with your buddies while you work on your cars. Custom cabinet depths and trim color to match your lift, butcherblock workbench tops, water heater or internal vacuum enclosure and more. Discuss the many design options with your designer. 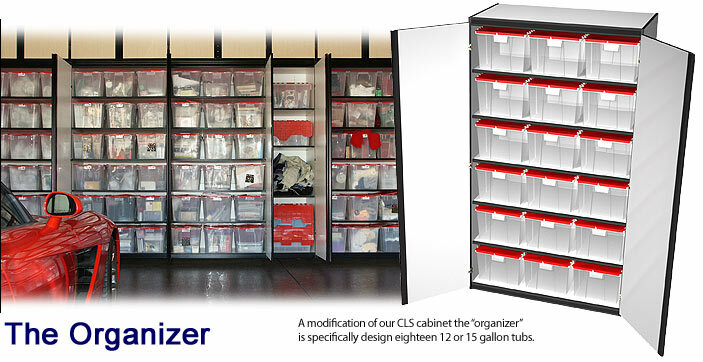 Let "We're Organized" make your garage dreams come true! 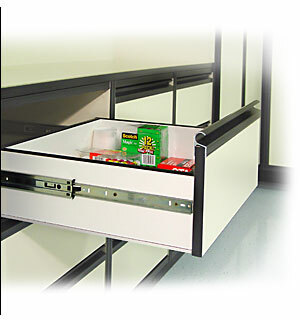 As an option to our standard 3/4-pull roller drawer slide we also offer the "Accu-Ride" ball bearing slide that offers smoother action and allows the drawer to extend completely past the cabinet caseing for easy access to drawer contents. Reaching and pulling out those items at the back of a shelf can be a real hassle. Especially when you have to bend over for those bottom shelves! 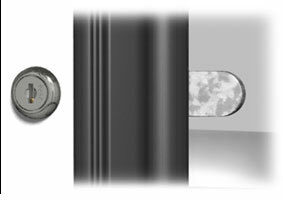 The answer: full extention pull-out shelfs on the "Accu-Ride" ball bearing slide. Do some serious pounding on your workbench? The answer for you could be our 1½ inch thick solid maple butcherblock top. We have delivered and installed these tops in seamless lengths up to 24 feet long. Like to keep the kids out of a cabinet where you store paint or chemicals? We're Organized has key locks available upon request. 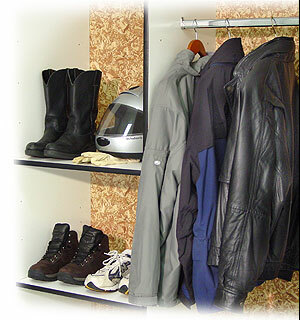 Keep an ongoing project, compontents and tools accessible, but quickly hidden behind cabinet doors. 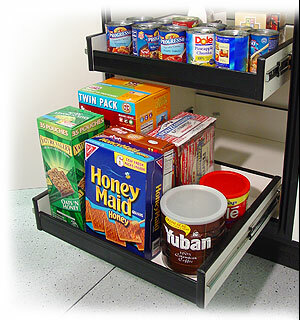 We can put drawers or a work surface and pegboard within our larger CLS or CD cabinet.